Yorktown is one of Virginia’s major tourist destinations, located within the “Historic Triangle” next to Jamestown and Williamsburg. It was the site of the last battle of the Revolutionary War and is a waterfront town with battlefields, museums, living history programs, shops, restaurants and outdoor recreation opportunities. You can easily spend a whole day or weekend in Yorktown as there are plenty of things to see and do. 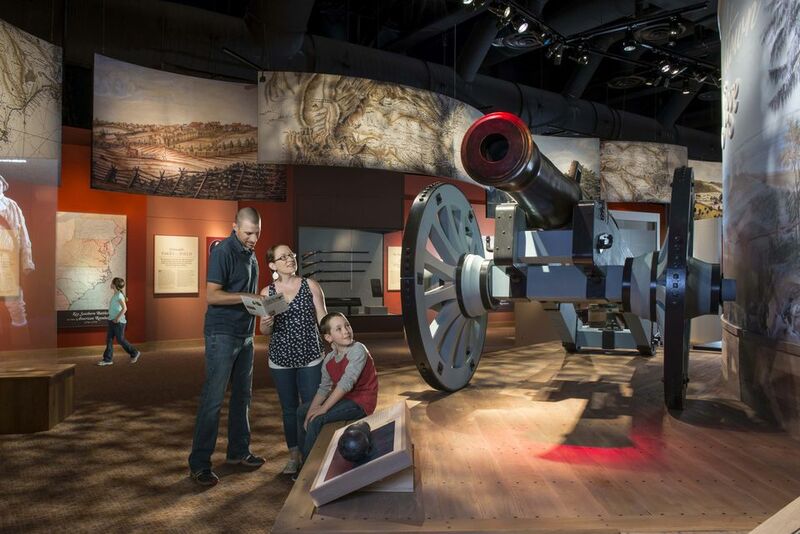 Three major attractions: The American Revolution Museum at Yorktown, the Yorktown Battlefield and Historic Yorktown are adjacent to one another and each offers interesting experiences for all ages. The American Revolution Museum is brand new and a replacement to the old Yorktown Victory Center. It brings the history of the Revolutionary era to life with indoor exhibits and an interactive outdoor living history Continental Army encampment and Revolution-era farm. Allow enough time to explore, at least 3 hours to visit each of the three major sites. Explore the outdoor living history areas adjacent to the museum, witness demonstrations of musket-firing and learn about early American farming. Take a walking or driving tour of the battlefield to see some of the key sites that led to America’s independence. Take a walking tour or ride the free trolley to explore the historic town and waterfront. Enjoy the view of the river from the Yorktown Victory Monument. 200 Water Street, Yorktown, VA. The museum tells the story of the Revolutionary period (before, during and after the war) through artifacts and immersive environments, dioramas, interactive exhibits and short films. Themed mobile app tours (available April 1, 2017) will allow visitors to customize their own experience so they can immerse themselves in the area’s that interest them most. A 4-D theater transports visitors to the Siege of Yorktown with wind, smoke and the thunder of cannon fire. The Continental Army encampment, located just outside the museum building, will include a drill field for visitor-participatory tactical demonstrations and an amphitheater to accommodate artillery presentations. The British Empire and America - examines the geography, demography, culture and economy of America prior to the Revolution and the political relationship with Britain. The Changing Relationship – Britain and North America - chronicles the growing rift between the American colonies and Britain. Revolution - traces the war from the battles of Lexington and Concord in 1775 to victory at Yorktown in 1781 and the aftermath. The New Nation - outlines the challenges faced by the United States in the 1780s with the creation of the Constitution as a framework for the future. The encampment - represents a portion of an American regiment and includes tents for soldiers and officers as well as surgeon’s and quartermaster’s quarters, is adding a drill field and an artillery demonstration area with tiered seating. Visitors explore the camp tents, witness demonstrations of musket-firing and surgical and medical techniques, and delve into the art of espionage. The Revolution-era farm - interprets the world of the 18th-century family of Edward Moss (c.1757-c. 1786), whose life is well-documented in York County, Virginia, records. Moss and his wife, Martha Garrow, had four children and owned six enslaved men, women and children. The farm provides insight into domestic life as well as the lives of enslaved African Americans during the American Revolution period. Hours: Open 9 a.m. to 5 p.m. daily year-round, until 6 p.m. June 15 through August 15. Closed on Christmas and New Year’s Day. Admission: $12 per adult, $7 ages 6-12. Combination tickets available with Jamestown Settlement, $23 per adult, $12 ages 6-12. Amenities: The gift shop complements and extends the museum experience with a comprehensive selection of books, prints, artifact reproductions, educational toys and games, jewelry and mementos. A café with seasonal food service and year-round snack and beverage vending offers seating indoors and on an outside patio. 1000 Colonial Pkwy, Yorktown, VA. The Yorktown Battlefield Visitor Center, administered by the National Park Service, features a 16-minute film, a museum with artifacts related to the Siege of Yorktown, ranger led programs, and information for self-guided tours. Visitors can explore the fields and historic buildings or take driving tour that includes the encampment areas. In 1781, Generals Washington and Rochambeau had the British army trapped along the shores of the York River. The allied American and French armies had all of the land routes blocked. The French navy blockaded escape by sea. General Cornwallis had no option but to surrender to the combined forces. The battle ended the Revolutionary War and led to America’s independence. Visitors can explore the fields and historic buildings or take driving tour that includes the encampment areas. Points of interest include Cornwallis’ Cave, the Moore House, Surrender Field, George Washington’s Headquarters, the French Artillery Park and more. Visitor Center Hours: Open daily 9 a.m. to 5 p.m. Closed on Thanksgiving, Christmas and New Year’s Day. Admission: $7 ages 16 and up. The Town of York was a major port serving Williamsburg in the early 1700s. The waterfront was full of wharfs, docks and businesses. Though it is smaller today than in Revolutionary times, Yorktown still functions as an active community. The Riverwalk area is a nice place to enjoy a meal, visit galleries and boutiques, take in the scenic views of the York River and listen to the sounds of The Fifes and Drums and live entertainment. You can rent a bike, kayak or Segway or lounge on the beach. A free trolley operates daily in Historic Yorktown from spring through fall, 11 a.m. to 5 p.m., with extended hours Memorial Day weekend to Labor Day. This Historic Triangle is a popular destination for visitors and offers an unparalleled view of colonial America at a time when Virginia was a powerful center of politics, commerce and culture. For a longer getaway, spend some time visiting Jamestown and Williamsburg.